There's no such thing as good corn on the cob. "Good" is much too vague a word to describe the extremes of corn quality. On one hand, you have rubbery, starchy, barely edible grocery store corn; on the other hand, you have heaven. Corn freshly plucked at the peak of ripeness is the stuff of Elysian Fields. Each tender kernel holds the fleeting sweetness of summer. But the only way to get corn like this is to buy it direct from the farmer, or grow it yourself. 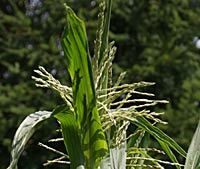 Corn can be a challenging crop for the Pacific Northwest gardener; it's time consuming, space hogging, heavy feeding, and heat loving. It's also attractive to raccoons. Yet, in my opinion, corn is one of the few crops (tomatoes and strawberries included) rendered thoroughly unpalatable by mass production. Anything as special as truly fresh corn is worth a little effort. After a dozen years of trial and error growing corn in my home garden, I've developed a method. Raised beds help warm the soil for earlier planting. Forget building boxes; simply dig out walkways and pile the soil up 6-8 inches to either side (raised beds are great for all crops). My beds are approximately 2 feet wide by 25 feet long. Each year toward the end of winter I top off each bed with 3 inches of compost, leaving it on top as mulch. Corn needs frequent watering, so this is a good time to run a soaker hose over each bed. I use 50-foot soakers, running them down and back for good coverage. If, like me, you plan to have several beds of corn, it's a real time saver to grab some PVC pipe and link up all the soakers for one-step watering. Finally, consider constructing a fence to protect your precious crop from raccoons. A week before harvest, add a couple strands of electric wire at 5 and 12 inches from the ground. I rely on Territorial Seeds for the majority of my corn seed. Early varieties offer the best chance of a good harvest. Some old standards, like Golden Jubilee, are a bit too late for many Northwest gardens. Try several varieties with a range of days-till-harvest; a different one in each bed is the safest bet and is an easier way to extend the harvest than planting a single variety every two weeks. 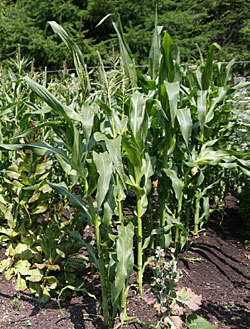 By planting, say, Precocious, Sugar Buns, Bodacious, and Miracle, one can enjoy fresh corn on the cob for 6 weeks. Don't mix Supersweets, popcorn, or ornamental corn with each other or with regular hybrid or Sugar Enhanced (SE) varieties. Each of these categories must be isolated from the others because, unlike most other crops, pollinization by other types affects taste and overall quality. It's all right to plant different SE varieties together, or Supersweets with Supersweets, etc. I'm not alone in preferring SE varieties over the Supersweets. The Supersweets don't germinate well in cool Northwest soils, and if you choose one Supersweet, Supersweets are all you can grow unless you separate them from other types by 25 to 100 feet. Finally, many people find the taste of Supersweets too reminiscent of cotton candy. The time to plant corn is when the lilacs begin to open, early May in my Zone 8 garden. The ground temperature should be 60° (you can use a kitchen thermometer to check). 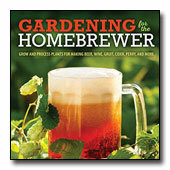 As soon as the weatherman promises a warm spell I get ready to presoak the seed. After ruining plenty of seed over the years, I've finally found success with presoaking: soak it overnight only, use Styrofoam meat trays for each variety with the name written on the tray, place a single layer of seed in a paper towel and over-saturate, and wrap the whole thing in a plastic bag. Change the water the next morning and plant the seed that day. For insurance, pot up peat pots with extra seed to fill in areas of spotty germination. Corn needs full sun, so don't overcrowd. After thinning, the seedlings should stand 8 inches apart. Corn is wind pollinated, so it should be planted in blocks of at least four rows, though my raised beds are close enough that my double rows per bed work well. First, I work two handfuls of alfalfa pellets at each spot where a cluster of seeds will be planted. For every cluster I plant 5-6 seeds, 1 inch deep, pressing the soil around them into a shallow bowl to retain water. Over the next 2-3 weeks I gradually thin to one plant per cluster. Then I water well and finish by covering each bed with floating row cover for warmth, and to protect the seeds from birds and voles. The beds are uncovered when the plants are 3-4 inches high. Keep the crop well weeded. Hand cultivate with care around the roots. Don't use glyphosate (Roundup, etc) as the young plants are sensitive to it. Once soil warms, the beds can be mulched to smother weeds and conserve water; grass clippings work well. Water regularly and feed plants every two weeks with fish emulsion. Rain or overhead watering when the pollen flies can reduce pollination and result in incompletely filled ears. Hybrids hold their quality for a week in the garden. There's no need to peel back the husk to determine if corn is ripe: simply feel for rounded (not pointed) tips on ears showing dry silk. It's common knowledge that the sugars in corn begin to turn to starch as soon as the ear is picked, but there is evidence that picking corn in the morning before the sun touches it (when the sugar is at its peak) and storing it in the refrigerator until dinnertime yields equally sweet ears. For four months you've weeded, watered, fed, and fussed over your crop. Now comes the payoff. Boil a pot of water – or fire up the grill – and get ready for a piece of heaven. Wendy Tweten is an an award winning writer living in Kingston, Washington. She is at least halfway to her goal of trying one of every kind of plant that can be grown in zone 8. Wendy studied horticulture and nursery management at South Seattle Community College. As a freelance writer, she specializes in home and gardening and Real Estate topics, and is a regular contributor to many Kitsap County and Seattle area publications. She is a member of the Garden Writers Association and her humor column is published in the Kingston Community News.